436 Marlborough is located on the south side of Marlborough, between Massachusetts Avenue and Charlesgate East, with 434 Marlborough to the east, and 438 Marlborough to the west. 436 Marlborough was designed by architect Obed F. Smith and built in 1885-1886 by Charles H. Dodge, mason, for building contractor George Wheatland, Jr., for speculative sale, one of six contiguous houses (430-432-434-436-438-440 Marlborough), arranged in a symmetrical group, the three to the east (430-434 Marlborough) with bays on the eastern side, and the three to the west (436-440 Marlborough) with bays on the western side. The peaks of the bays have varied designs. George Wheatland, Jr., is shown as the owner on the original building permit for 436 Marlborough, dated October 16, 1885. At the same time, George Wheatland, Jr., was having six more houses built at 381-391 Commonwealth on the lots to the south, behind 430-440 Marlborough, also designed by Obed Smith and built by Charles Dodge. George Wheatland, Jr., purchased the land for 430-440 Marlborough and 381-391 Commonwealth on June 20, 1885, from Henry M. Whitney. It was part of a parcel Henry Whitney had acquired in two transactions, on November 24, 1882, and on March 20, 1885, all part of a tract of land originally purchased from the Boston Water Power Company on June 1, 1880, by a real estate investment trust formed by Francis A. Palfrey, Francis A. Osborn, and Grenville T. W. Braman. 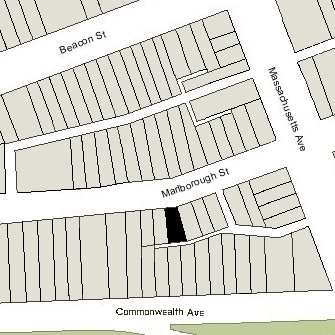 Click here for an index to the deeds for 436 Marlborough, and click here for further information on the land west of Massachusetts Avenue between the south side of Beacon and the north side of Commonwealth. 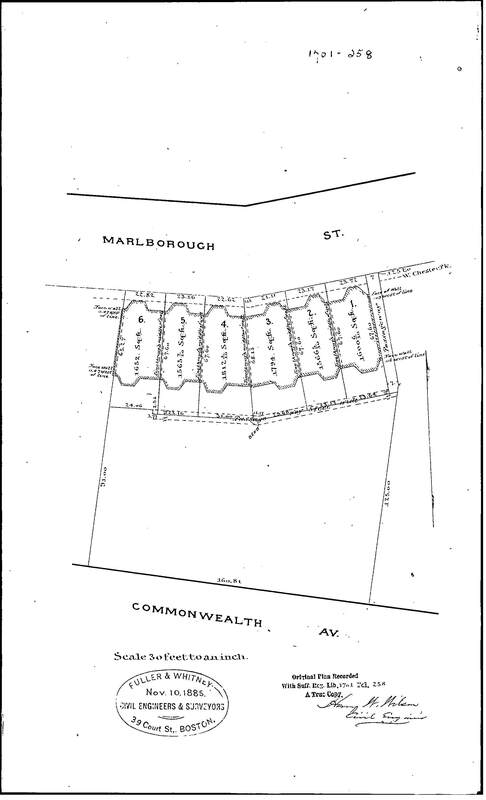 On January 4, 1887, 436 Marlborough was purchased from George Wheatland, Jr., by Nancy T. (Cummings) Kehew, the wife of oil merchant John Kehew, They previously had lived on Grampian Way. John Kehew died in February of 1889. Nancy Kehew moved soon thereafter. On May 24, 1889, 436 Marlborough was purchased from Nancy Kehew by Grace T. (Haley) Lambert, the wife of William Thomas Lambert. They previously had lived at 259 Walnut Avenue. William Lambert was manager of the Leonard Silk Company. They continued to live at 436 Marlborough during the 1894-1895 winter season, but moved thereafter back to 259 Walnut Avenue. On December 14, 1895, 436 Marlborough was purchased from Grace Lambert by Thomas Tracy Bouvé, treasurer of the Glendon Iron Works and formerly a commission merchant, He and his wife, Emily Gilbert (Lincoln) Bouvé, made it their home. They previously had lived at 40 Newbury. They also maintained a home in Hingham. On March 21, 1896, Thomas Bouvé transferred 436 Marlborough to his son, Walter Lincoln Bouvé, an attorney, as trustee on his behalf. Thomas Bouvé died in June of 1896. Emily Bouvé continued to live at 436 Marlborough and in Hingham. On August 9, 1900, Walter Bouvé transferred the property into his mother’s name. Emily Bouvé died in February of 1903. In her will, she left the bulk of her estate, including 436 Marlborough, to four of her five children: Walter Lincoln Bouvé; Charles Osborn Bouvé; Emily T. (Bouvé) Osborn, the wife of Francis A. Osborn; and Ada Bouvé. Her fifth and eldest child, Edward Tracy Bouvé was not included. She indicated that “The exception of my son Edward from participation in property is because of his own expressed wish.” The four Bouvé siblings continued to own 436 Marlborough and lease it to others. By the 1903-1904 winter season, 436 Marlborough was the home of Dr. Joseph William Courtney, a physician specializing in nervous disorders, and his wife, Margaret C. (Flynn) Courtney. He also maintained his medical office at 436 Marlborough. They previously had lived (and he had maintained his office) at 409 Marlborough. Charles Bouvé died in November of 1907 and his interest in 436 Marlborough was inherited by his wife, Caroline Lincoln (Lane) Bouvé, and their two children, Alice and Charles. On April 1, 1910, Walter Bouvé acquired Emily (Bouvé) Osborn’s interest in 436 Marlborough, and on September 9, 1912, he acquired the interest of Caroline (Lane) Bouvé and her children. The Courtneys continued to lease 436 Marlborough from Walter Bouvé and Ada Bouvé through the 1915-1916 winter season, but moved thereafter to 94 Bay State Road. 436 Marlborough was not listed in the 1917-1920 Blue Books. By the 1920-1921 winter season, 436 Marlborough was the home of Louis (Lewis) Clinton Porter, a salesman, and his wife, Ella Frances (Wood) Porter, who operated it as a lodging house. They previously had lived at 119 Hemenway. Louis Porter died in January of 1930 and Ella Porter moved soon thereafter; she died in October of 1931. During the 1930-1931 winter season, 436 Marlborough was the home of Flora E. (Clifford) Speed, the widow of David George Speed, and their son, Shirley Clifford Speed. They operated 436 Marlborough as a lodging house. They previously had lived at 17 Hemenway. 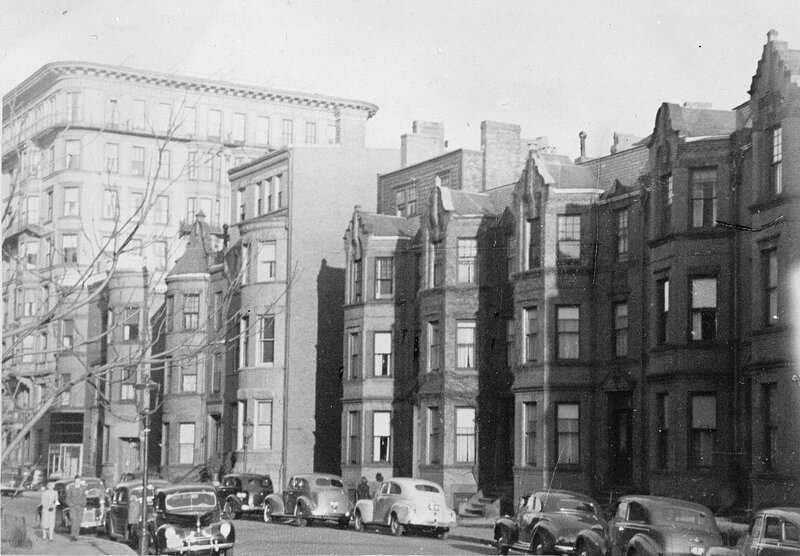 S. Clifford Speed was a real estate dealer who converted many Back Bay properties into lodging houses. By 1931, they had moved to 40 Fenway. By 1932, 436 Marlborough was the home of William Robert MacLennan, a machinist, and his wife, Matilda M. (Vickers) MacLennan, who operated it as a lodging house. They previously had lived at 16 Bostonia. They continued to lived at 436 Marlborough until about 1937. By 1940, they were living in Arlington. By 1938, 436 Marlborough was the home of William Lincoln Wright, Jr., a civil engineer, who operated it as a lodging house. He previously had lived in Worcester with his wife, Sara Margaret (Cole) Wright. They divorced and he moved to Boston. He married again in November of 1941 to Mabel Clara Madsen. They moved soon thereafter to 29 Gainsborough. 436 Marlborough was not listed in the 1943-1946 Lists of Residents and was shown as vacant in the 1943-1946 City Directories. Walter Bouvé died in September of 1944, and his three-fourths interest in 436 Marlborough was inherited by his wife, Charlotte Burr (Harden) Bouvé. The remaining one-fourth interest continued to be owned by his sister, Ada Bouvé. On March 20, 1946, 436 Marlborough was acquired from Charlotte Bouvé and Ada Bouvé by Helen B. Perkins, and on April 1, 1946, it was acquired from her by Mary O’Keefe. Mary O’Keefe operated 436 Marlborough as a lodging house. She previously had lived at 45 Commonwealth as a lodger. She continued to live there until her death in April of 1954. 436 Marlborough was inherited by Mary O’Keefe’s cousin, Bridget P. (Keeffe/O’Keefe) Kelleher, the wife of James D. Kelleher. They lived in Belmont. 436 Marlborough continued to be operated as a lodging house. On December 31, 1963, 436 Marlborough was purchased from Bridget Kelleher by real estate dealer Francis Ralph Sundbergh and his wife, Julia (Abraham) Sundbergh. The property changed hands and on December 9, 1968, was acquired by Catherine M. Grant, trustee of the Restrom Trust. In April of 1977, the Restrom Trust, filed for (and subsequently received) permission to convert 436 Marlborough into six apartments. On April 3, 1978, the Beacon Capital Corporation foreclosed on a mortgage given by the Restrom Trust and took possession of the property. On June 23, 1978, 436 Marlborough was acquired from Beacon Capital by Peter P. Papesch, an architect and real estate developer. He and his wife, Barbara G. Papesch, lived at 433 Marlborough. 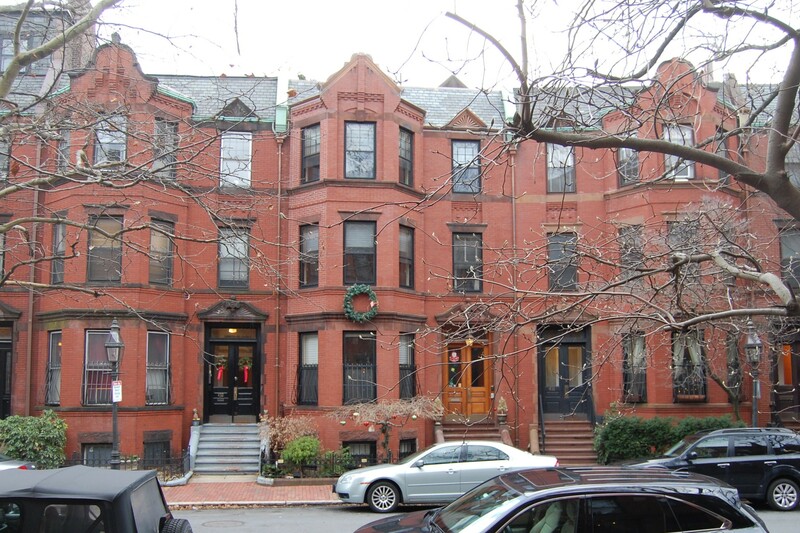 On the same day, he transferred the property to himself as trustee of the 436 Marlborough Street Realty Trust. In September of 1978, he filed for (and subsequently received) permission to reduce the number of units from six to three. 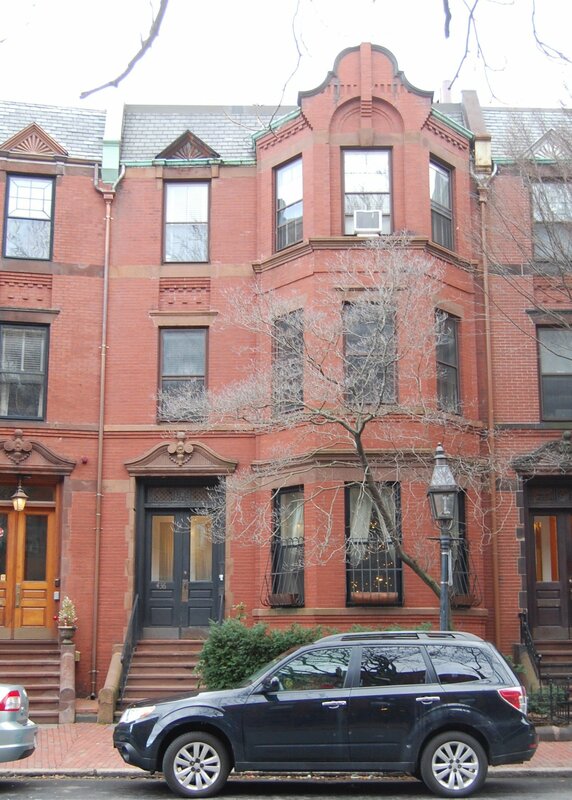 On July 5, 1979, Peter Papesch converted the property into three condominium units, the 436 Marlborough Street Condominium.